Little is known about how adolescents experience clinical trials. 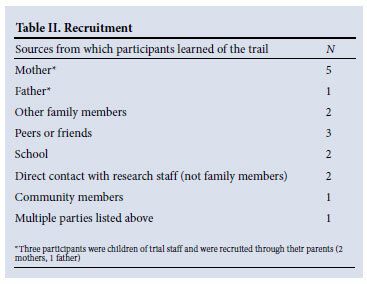 We assessed the experiences of South African adolescent participants in a clinical trial, employing semi-structured interviews to gather qualitative data on the experiences and effects of trial participation. Despite misunderstanding certain concepts regarding assent and trial processes subsequent to enrolment, participants reported positive experiences overall. Subjects' motivations for participation included: an ability to help others; receipt of healthcare; and free blood screening. Participants expressed fears associated with trial procedures, such as phlebotomy; however, these apprehensions diminished as the trial progressed. We found that conducting qualitative research within a trial site is feasible, and can provide insight into the uptake and acceptability of interventions. We aimed to assess the experience of adolescent trial participants and evaluate the feasibility of conducting qualitative research within a clinical trial. The trial site was in the Breede Valley, Western Cape, where tuberculosis (TB) is endemic. Respondents were participants in a phase 1, randomised, placebo-controlled trial of a novel TB vaccine candidate. We used a qualitative approach and conducted semi-structured interviews. Purposeful sampling was intended to ensure that expressed views reflected the diversity of the study population. Interviews were conducted in English with available interpretation in isiXhosa and Afrikaans. Interviews were subsequently transcribed, and translated into English by transcribers who were unaware of the research aims and participants' identities. We used manual thematic content analysis to identify emerging themes. Ethics committee approval of the study was obtained from the Medical Research Council and the University of Cape Town. After trial closure, 17 interviews had been conducted. Participants ranged from 13 to 18 years of age (median age 16). All participants spoke English at school. Home languages included Afrikaans (9 participants), isiXhosa (4), English (2) and a combination of languages (English/Afrikaans (1); English/isiXhosa (1)). Participants varied in their knowledge of TB prior to the trial (Table I), and had learned of the trial from numerous sources (Table II). Fourteen participants discussed which person had assisted them with their decision to assent: 10 stated that a parent had helped them with their decision, 9 of whom said that this parent was their mother, and 2 stated that their mothers had enrolled them in the study. Trial visits were an opportunity for subjects to connect with fellow community members, and to meet new people. All respondents made new connections at the trial site: 7 maintained contact while others (10) lost contact because the site visits ended. Participants differed in their perceptions of the purpose of the trial. Eleven thought that they understood the research, but only a few could explain the aim of the trial when asked to do so; 3 understood that the trial intended to test the efficacy of a TB vaccine ('It's to study if the vaccine was protecting you against TB'); 3 believed that the trial aimed to find an antidote to TB but did not expressly state that it was a vaccine trial; and 4 misunderstood the trial as blood screening for TB ('It was so that you could know if you were sick or - if you have TB'). Two participants understood the research as blood donation: 'I just know that, because they need more blood for other people.' Four participants stated that they did not know what the research aims were. Confusion between the drawing of blood (for screening) and blood donation was evident. Vaccine, injection and blood-drawing terminology were often used interchangeably. A minority (3) understood TB to be a sexually transmitted disease. Eleven participants were able to recall the consent/assent process, 5 could not, and 1 reported that he/she was not present but that his/her mother was (in order for the formal consent process to be validated, the participant had to be present during a consenting session). All but 2 respondents answered that there were no negative aspects to their participation in the trial. We believe that this is the first South African study evaluating the experiences of adolescents in a TB vaccine trial. Overall, subjects' experiences were positive. Motivations to participate included: an ability to help others; receipt of healthcare; and free blood screening. Consistency of the employ of staff members whom participants knew from the community, and the provision of information by the former while maintaining a light mood were integral to participants' positive trial experiences. Qualitative research provided information-rich data that highlighted themes most salient to adolescent participants4 and the utility of such findings for informing trial research. As with previous research,5 motivation to participate was driven primarily by altruism and health-seeking behaviour. Most subjects relied on their mothers' approval. Some suggested that their mothers had enrolled them in the trial, raising issues of whether assent can be withheld when parents have consented, especially where participation results in income for families.6 Context-based research is needed to understand the pressures that adolescents face in the decision-making process. Participants recalled their fear of needles, blood collection and test results, which decreased with ongoing exposure. Trial participation, with pre-test counselling, could therefore reduce subjects' fears and other concerns. The misunderstanding of the trial aims was not specific to the participants in this study. Misconceptions that trial participation protects participants from the researched disease need to be dispelled.7 Some participants were unaware that trial participation had prophylactic potential, instead believing that the purpose of the trial was for blood donation or screening. Obtaining informed consent does not necessarily equate to informed participants. Limited recall of the informed consent process may indicate that less emphasis should be placed on a single informed consent session. Continuous consent,8 or repetition paired with discussion of trial details, may dispel confusion. The study strengths lie in trial participants being allowed the opportunity to voice their opinions. The time lapse of nearly a year between initial trial consent/assent and the subsequent interviews possibly limited recall. Interviews were conducted during a school holiday break which might have resulted in more positive responses, whereas those with negative experiences might have been less likely to attend interviews. Conducting interviews at the trial site might have introduced response bias. The use of interpreters during interviews might have led to loss of response nuances. Further research is needed to understand adolescent consent/ assent experiences and their comprehension of the processes involved. This applies particularly to participant counselling in the context of limited funds. Ethnographic research should focus on understanding participation in a wider context. Acknowledgements. We are grateful to the adolescents involved in this study, for their time and efforts. Special thanks to site staff for facilitation and support of the research. This study was fully funded by the MRC Clinical Trials Initiative and we are grateful to Dr Ali Dhansay for his support. Acknowledgements to Leon van Wyk for his services. Author contributions. AA and NS developed the concept for the research. AA, NS and HG developed the interview guide, and AA conducted all interviews. All parties were involved in the synthesis and analysis of data. AA drafted this manuscript, and all authors contributed to the final version.